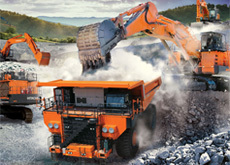 Hitachi Construction Machinery Co, Ltd. | Network Directory : Hitachi in the U.S.A.
Hitachi Construction Machinery leverages Hitachi's experience which spans over 100 years to manufacture highly efficient, reliable and durable excavators and haulers. We provide a complete plethora of excavation and heavy hauling services and solutions mapped to the unique requirements of our clients. From construction excavators to mining excavators, shovels and trucks to foresters, Hitachi has an excavation and hauling solution for all your requirements. In addition, we also provide other services such as jobsite analysis, remote machine monitoring and safety and training, amongst others.